Another new entry in open heel fins, the Wave uses three material construction to apply specific properties where needed. 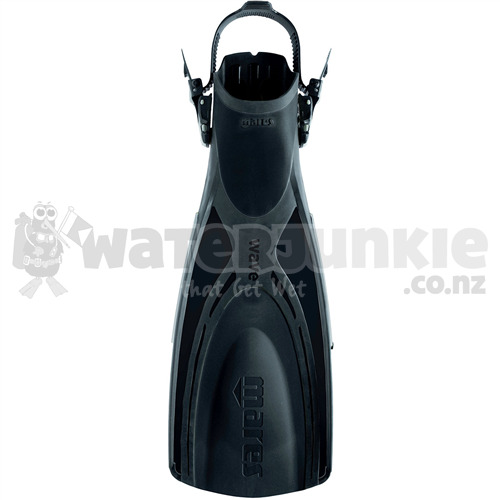 The upper part of the foot pocket is moulded in soft rubber to guarantee the maximum comfort. The blade has big soft rubber insert perfect to get the ideal Super-Channel water flow. The remainder has the rigidity and strength needed for superior propulsion. The ergonomically designed foot pocket delivers maximum power and evenly distributes pressure over the foot to minimise fatigue. The foot pocket interior features internal ribbing that improves fit, eliminates foot suction and prevents foot pocket flexing, while transmitting more power to the blade. Wave uses Mares patented design ABS Plus Buckles (Adjustable Binding System). It only takes one quick movement to easily open or close these buckles, even when wearing thick neoprene gloves. The double button release prevents the buckles from accidentally opening making them the most user friendly system on the market. 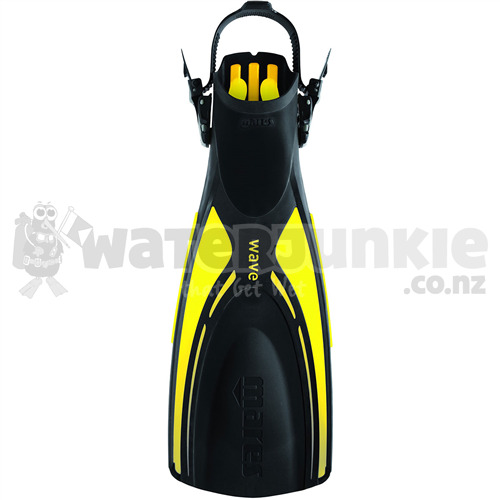 The Super-Channel is designed for the diver who wants the perfect blend of power and efficiency in one fin. The new blade design with a large central Super-channel and two traditional lateral channels provide excellent thrust while maintaining hi-efficiency and minimising leg fatigue. The blade is constructed of Tecralene and Thermoplastic rubber for extended durability. 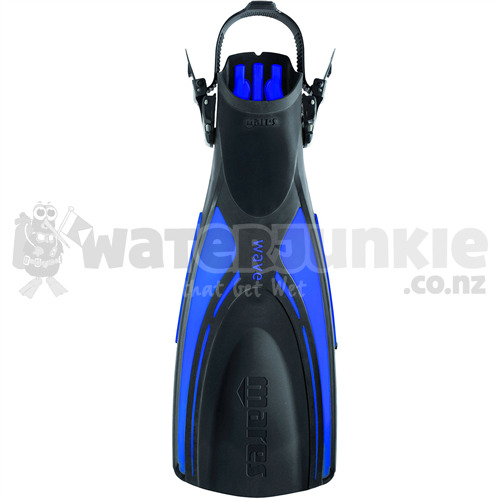 Fin comes in three colours and three sizes, has an overall length between 58.5 to 66 cm and weights 1.26 kg to 1.7 kg depending on size, and come with a 24 month limited warranty.